I am learning to let go of my past but there are still those who choose to hold on to theirs. They continually try to make me feel guilty about it and constantly throw it in my face. There was a time in my life when it worked. I would feel guilty or bad about things I have done and would try to make things better by always saying yes to whatever demands were being made. I would do things against my will for the sake of attempting to make peace. I realize today that I was not helping the situation or healing myself. I was in reality being held prisoner by my past and being manipulated by those individuals. I also realize today that I cannot change the past. I cannot erase what happened by being a yes man. I have to move past it, apologize when I can and not be made to feel like I owe someone because of it. If I have made ammends and someone doesn’t accept it, that is not on me. It is no longer my responsibility to continue to try to make it right. I will not be held hostage by anyone because they will not forgive me. I have learned to say NO. Regardless of how I feel. I am learning that I cannot keep being a slave of my past by trying to make things right in the present. Just for today I will not feel guilty because I said no. 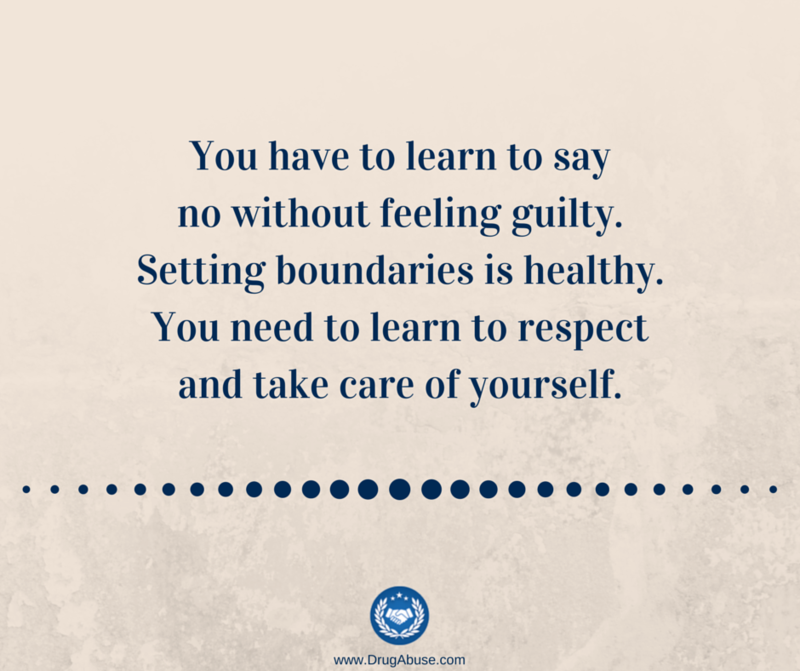 I will set boundaries and continue to find balance in my life. With or without you. This entry was posted in 2015 and tagged addiction, balance, change, compassion, destination, experience, failure, faith, fears, fellowship, gratitude, happiness, hope, insecurities, love, progress, recovery, secrets, service, strength, struggle, suggestions, triumphs. Bookmark the permalink. Excellent blog Eric! I was always feeling guilty and was stuck in the past because I kept listening to others who kept judging me by my past instead of looking at who I am in the present. Be proud of you and all you’ve accomplished. You are a constant inspiration to many. You have come one hell of a long way on a very difficult road. Kudos my friend. Hope you have a fabulous weekend. You’re absolutely right Karen. If they can’t let it go its not my concern. I made my amends and thats all I can do. I refuse to continue to hold the guilt and give them power. I can and will move on without them. Thank you for sharing this and for your continued support and encouragement. Very well said… I have that problem every day of my life. Thank you Juan. Its sad that people expect me to keep paying for something that is long over but I refuse to keep holding on to the guilt. I will let them stew in it but I refuse to participate any longer. CONGRATULATIONS Eric. That is a major step in life. And hopefully when others see you moving on in a positive manner, and not allowing yourself to be pulled down or backwards again, they will realize they can change as well. God’s Blessings my Friend. Keep on keeping on, and keep growing. Thank you George. Its an in going process but it is definitely doable. I appreciate your kind words, support and encouragement always. Thanks and have a blessed day.